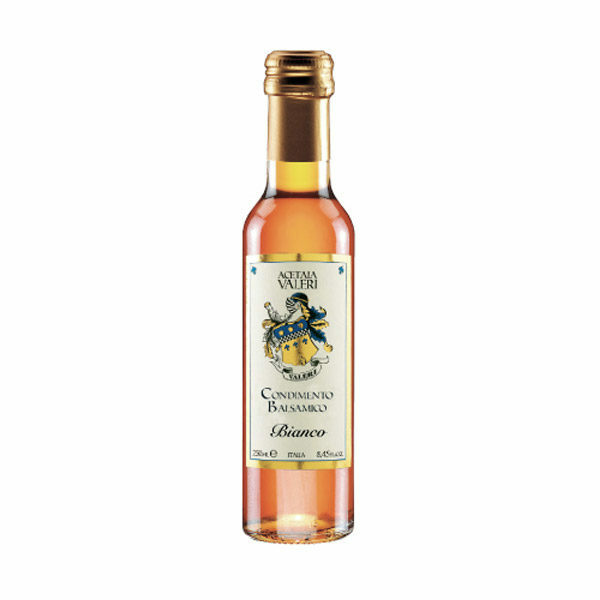 Shopping chart “Condimento “Botte Piccola” confezione regalo 100 ml” has been added to your shopping cart. Seasoning obtained IGP products already scrupulously (protected geographical indication) using only grape and wine vinegar but without caramel or other products of manipulation. Seasoning "White" : This is a seasoning made from PGI products and supply chain that stands out for its color transparent blond, maintained to satisfy those customers who do not use wine vinegar for its rugged body and that, does not like the dark balsamic vinegar dripping flow. For its pleasant sweet and sour balance is ideal for marinating meat or fish, on raw and cooked vegetables, on soft cheeses and young but lends itself well even on white meat. Great product great for salads, vegetables, white meat, fish and mozzarella, the intense sour taste – ideal alternative to sweet wine vinegar and deglaze the cooking meat and fish. The Toppings: Everything that does not follow the specification PDO or PGI for even a parameter of that regulation, must be otherwise defined on the label, for us then “Seasoning” We are going to accompany you to a proper name to distinguish the product commercially. Are usually made by the same production of balsamic vinegar of Modena or derived from the same supply chain of the two PDO, complete with different aromas acquired in steps different barrels, to ensure that products from real alternative and balsamic aromas. The toppings are used according to what is already known and recommended for PGI and DOP but, the more or less evident and original flavors that might express, interesting and different emotions can give off the palate so as to make them a viable alternative for those who appreciate, Discover and diversify, the pleasures of the table. This site uses Akismet to reduce spam. Find out how your data are processed.